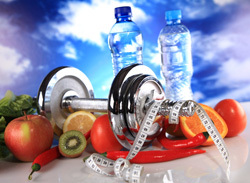 Fitness and Diet Plans… Which One is Right for You? There are many programs that claim to be the best fitness and diet plans. I have tried most of them. What happened was I got frustrated when they didn’t produce the desired effect or didn’t have lasting results because it is not a realistic lifetime plan. What I have found is a daily fitness plan combined with a lifestyle of healthy food choices that gave me the desired results. The best part is that it’s a realistic maintainable program for lifetime health and optimal fitness. My fitness plan consists of weight training at least 4 times a week. If I have the time I do 5 days. Many women tell me that they cannot do that many days a week but when I look over their current fitness and diet plans they are actually spending that much time in the gym. The time however is not spent in weight training but in group classes or excessive cardio. I have found the best weight loss and fitness plans do not mean more cardio but less. It does not mean less food but more! Have I gotten your attention yet? Many women spend hours on what I call the cardio fitness plan. The fitness and diet plans that work are the ones that build lean muscle mass and this can only be done by lifting weights. As we age, our skin naturally begins to sag. Your lean muscle development will give you the lift you need to prevent this sagging and deliver the best, sexiest fit you at any age. The best news yet is that building all that extra lean muscle will give you freedom or I should say flexibility in your eating. Did you know that just 1lb of lean muscle burns 75 to 100 calories a day while 1lb of fat burns only a mere 3-7 calories? This is the “big secret”! The reason why is because while you are on the treadmill trying to burn off that popcorn you just had at the movies, my muscle is burning mine off without me walking or running a single solitary mile. My lean muscle is doing it for me. No extra work involved. I just move along with my lifestyle plan, allowing moderate indulgences and enjoying my family. That’s living and realistic! Fitness and diet plans shouldn’t be “event preparation” moments in your life. The reason that often they are only for special occasions is because these plans cannot be maintained because of the harsh expectations. These kinds of fitness and diet plans are always short term in nature. This produces an unhealthy weight loss and weight gain cycle, wrecking your metabolism. I eat 5- 6 small meals a day. I am never hungry. This actually revs my metabolism and helps me to maintain my lean muscle. I also hear women say that they are afraid to bulk up and look like a man. You have seen my pictures. I lift heavy weights and I am not bulky. That is because I do not have the testosterone that men have. Nor do you. You will only build beautiful lean, toned muscle. Let me help you with the best weight training exercises to get the best lean muscle as well as the best fitness recipes to maintain your hard work at the gym or at home. Fitness and Diet plans should be about living life, a healthy and fit life. Let me help you achieve the lifestyle plan that you have always wanted. Contact Me for more information or for a FitBody Lifestyle Consultation.